Coolant is the fluid that flows through your engine, keeping it from overheating. It’s a mixture of antifreeze and water, and its main purpose is to transfer heat generated by the engine to the radiator, where it can cool off before returning to the engine. This process is a continuous one, and it keeps your engine at its optimal operating temperature, for smooth running, good fuel economy and properly controlled emissions. 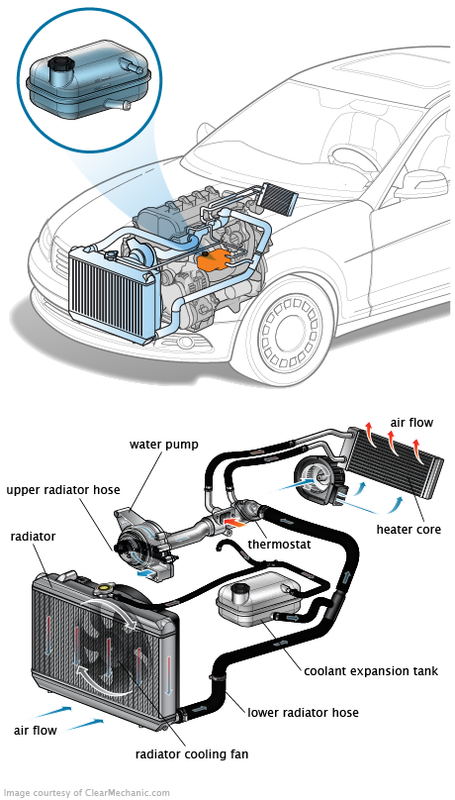 The coolant also runs through a small radiator-like device inside your car’s dashboard. This is where the warmth from your heater comes from. Turning on the heat allows the hot coolant to warm up the heater core; the blower fan then moves warmed air into the passenger compartment. Your coolant performs other protective duties as it circulates. Its alcohol content protects against freezing at low temperatures. Special additives in your coolant also prevent corrosion, rust and mineral deposits from forming in the system. If your coolant looks (or smells) bad, it’s way past its useful life. Fresh, healthy coolant will retain its original bright hue, which can be green, red, orange or some other color. If your coolant has deteriorated this much, you may want to get a coolant flush instead of just a change. A mechanic can take care of this. If your car starts suddenly running hotter than normal (but not necessarily in the red danger zone), your coolant could be depleted. Wait until you’ve stopped driving and the car has gotten cold, then check the coolant. If it’s full, it could be too old. And if it’s low, it’s time to top it up and check for a leak. There could also be blocked coolant passages or hoses, the result of circulating rust and sludge. Call a mechanic for an appointment to have your cooling system checked. This is a more extreme version of the previous scenario. Your temperature gauge will definitely hit the red zone if this happens. You must immediately pull off the road and shut off your engine, before any serious damage is done. This could be the result of very bad coolant, or a number of other mechanical issues. Call a mechanic, and have your vehicle towed to the shop. It can’t be driven until it’s repaired. Your coolant deteriorates over time. As it ages, it becomes more acidic, and less able to prevent rust and corrosion. If you continue to drive your vehicle after the coolant has reached this condition, the buildup of gunk on various parts of your cooling system can cause serious damage and even system failure. Old, worn-out coolant can also lose its ability to protect your engine from the extremes of freezing and boiling. This can definitely be a problem in the dead of winter, as well as during the heat of the summer. Either situation can lead to very expensive repairs. This is why it’s crucial to replace your coolant regularly. How often should you do it, though? The best place to check is your owner’s manual. Follow its recommendations on coolant changes (and other maintenance) to keep your car running smoothly. My car is not holding coolant and is smoking?